Electronics 102 is an online, interactive course covering basic analog electronics components such as diodes, transistors, and operational amplifiers. Designed for NI ELVIS II/II+. 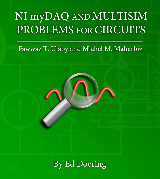 This supplement to Circuits by Ulaby, Maharbiz, and Furse contains 40 additional homework problems designed for three-way solutions: analytical, simulation, and measurement. This is an intermediate level course covering both combinational and sequential digital electronics topics. Designed for NI ELVIS II/II+. This widely adopted work conveys a set of timeless principles and problem solving techniques in a modern context, but also provides a valuable framework for subsequent studies. 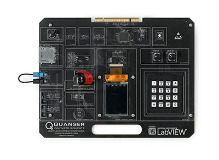 The QNET Energy Conversion board provides an experimental platform to introduce fundamental concepts of power electronics and energy conversion. Designed for NI ELVIS II/II+. This laboratory companion supplement features a collection of 11 labs that foster comparison between theory, simulation, lab data, and analysis. Designed for NI ELVIS II/II+. This lab introduces students to fundamentals of microcontroller I/O and inter-communication including industry standards, such as SPI, I²C and CAN buses. Designed for NI ELVIS II/II+. Circuits 101 is an online, interactive, introductory course covering basic analog circuit topics from component measurements to RLC circuits. Designed for NI ELVIS II/II+.